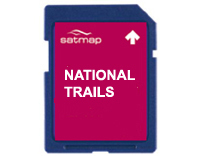 Satmap GB National Trails Premium: The Pennine Way (OS 1:25k & 1:50k) (UK-NT-PREM-SD-001-T) | Discount GPS Accessories from mysatnav.ie Ireland's leading GPS & Sat Nav store. This was Britain's first National Trail and is arguably one of the most popular long distance footpaths in Britain. Running from Edale in Derbyshire across the rugged backbone of England to Kirk Yetholm in Scotland, the Pennine Way is a classic route. With over 60% of the trail passing through National Parks of the Peak District, the Yorkshire Dales and Northumberland, visitors can experience some of the finest upland walking in England, taking in the sweep of grand panoramas, picturesque villages, moorlands, forests and river valleys. Length of path 430km/269miles.